In the recent past a couple of photographer friends from Canada wanted to visit Scotland. I happily offered to take them out to see the country through the eyes of a landscape photographer. Our itinerary included a few days on the Isle of Skye, a couple of days in the Inverpolly and Assynt areas of the Scottish highlands and a couple of days around Glencoe and Ranch Moor. I can say that, for this time of year, we were quite lucky with the weather – most importantly, there were no midges around. They loved all the locations and were constantly inspired by the Scottish landscape and its transient light. While in Glencoe we met up with two more fellow photographers. They joined us for our daily trips in the area and we all enjoyed each other’s company and humour. During one of our excursions in Rannoch Moor we were lucky to experience some mist all over Loch Ba – the place looked breathtaking. We decided to stop near a location that I had never been to before. The reason we stopped there was that, due to its slightly higher altitude, we would have a much wider view to photograph the entire area. The reason I had never stopped there before is simple. As you can see from the picture, this area used to accommodate a small forest. At some point in the last few years all of the trees were cut down, with the result being that the place now looks a mess and is highly uninspiring – or is it? Upon our approach my fears were coming true, this was not a place for photography – not to worry though, we were there for one reason and that was to photograph the distant mist. However, as we walked closer and closer, I started having second thoughts. Every cut down tree was surrounded by its own microcosmos. Most roots were now exposed to the elements and a whole world of moss had taken over almost every inch of the ground. I completely forgot that I was there to photograph the misty landscape in the distance. Instead, all my senses had now been taken over by the scene around me. Even more so, the very thought that this location was facing east started adding many beautiful thoughts of an extraordinary sunrise in my head. My decision was final; I had to go back there again, very soon. A couple of months later I was running a workshop in the area. I planned to be there a day earlier – the reason is obvious. Indeed, one day before the workshop started I was standing at the very spot that I was eager to photograph. I already had a mental picture of what I wanted to capture. I found the composition that suited my style and, after a bit of gardening, I captured what you see here. The glorious sunrise never happened but there is always another day. Besides, the moody early morning sky suits the location’s mood nicely. I do understand that some places may appear chaotic at first glance. However, I am of the opinion that, if you can create an image out of chaos, you can create one out of anything. I suggest you visit a location that so far you thought was messy, spend some time looking around, and I believe that you can walk away with a beautiful image. 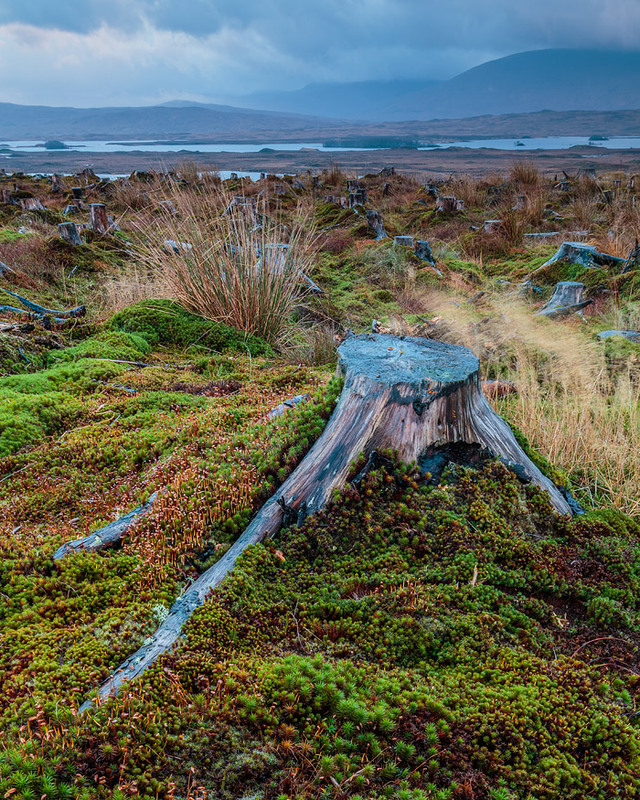 If you visit the Rannoch Moor area of Scotland and decide to stop by these tree stumps, please be very careful of where you step; the moss is very delicate and it has taken many years for it to fully grow to its present condition. 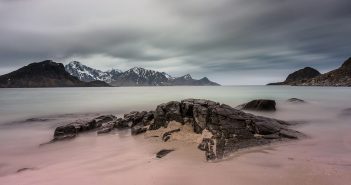 Very interesting to read your comments and a cracker of a shot with those lovely foreground details and the tree roots. Last time I went there for three days. First day yellow weather warning ,2nd amber,3rd red, camera’s never got out of our bags. 40 miles down the road lovely sunny days. Still enjoyed!! Thank you for your lovely comment, Peter, and I wish you better luck with the weather next time.